On this page you'll find a list of dates when Wikipedia Editing workshops are scheduled to take place, along with essential links. If you plan to come to any of the workshops we recommend you bring a laptop with you. Wi-fi will be available on site. If you like, you can also learn a little about editing ahead of time by following the official Wikipedia Tutorial, or see Getting started on Wikipedia for more information. These workshops are normally designed as instructional sessions of an introductory nature or focusing on specific advanced aspects of editing. We also hold Edit-a-thons where you can come along and create or edit articles about a specific topic. Sometimes the edit-a-thons will also feature a quick guide for new editors (or a refresher for novices) to ensure that participants can take part in the proceedings more fully. Upcoming workshops will be listed here. Follow us on Facebook or Twitter. 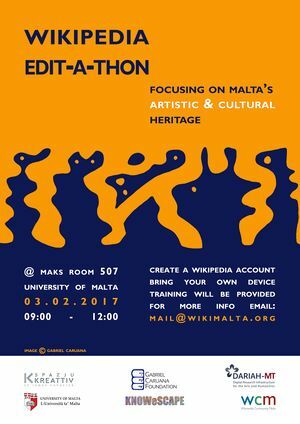 Goal for this session: To create and improve Wikipedia pages about women artists in Malta. Goal for this session: explore the power of Wikipedia as a knowledge-sharing tool and learn editing basics ahead of the upcoming Art+Feminism Edit-a-thon. In collaboration with the Gabriel Caruana Foundation. A general introduction the Europeana Art History Challenge. This session is also suitable for anyone who has never attended a previous Wikimedia session. A general introduction for new Wikipedia editors. Come along if you're interested in learning how to edit Wikipedia. This session is also suitable for anyone who attended a previous session. A general introduction for new Wikipedia editors during the Electronic Music Malta convention. A general introduction for new Wikipedia editors. Come along if you're interested in learning how to edit Wikipedia. WCM has provided Wikipedia editing workshops for Bioversity at its HQ in Rome, Italy on two occasions. During these workshops, researchers and other associates of Bioversity explored ways to share their expert knowledge on agriculture and forestry. 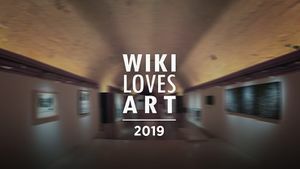 This page was last edited on 13 March 2019, at 09:23.